GPS is a very useful device which is used in many electronics projects and applications like vehicle tracking system, GPS Clock, Accident Detection Alert System, traffic navigation and surveillance system etc. But question is how to use the GPS and read the data from GPS? We can easily get the GPS data directly into our computer using Arduino. GPS stands for Global Positioning System and used to detect the Latitude and Longitude of any location on the Earth, with exact UTC time (Universal Time Coordinated). This device receives the coordinates from the satellite for each and every second, with time and date. GPS offers great accuracy and also provides other data besides position coordinates, we will into look it shortly. In this arduino GPS tutorial, we are going to explain that how to Test or Interface GPS module using Computer and Arduino. For interfacing GSM with computer we either need USB to Serial Converter or Arduino Board. Here we are using Arduino board to interface GPS. We only need Arduino Board, GPS module, computer and 12v/3.3v adaptor for power supply. Here we have used GPS receiver Module SKG13BL (shown in above figure). After connections, connect the USB cable to the computer, open your Arduino IDE software in computer, select com port and open serial monitor to listen the serial port and Power up the Arduino and GPS module. Now you will see GPS data on Arduino Serial Monitor Window like below. Below are two snapshots, first one is, when GPS is not in range and second one is, when GPS in range. In serial Window, you can see some sentences that start from $ sign. These are NMEA sentences. GPS module sends the Real time tracking position data in NMEA format (see the screenshot above). NMEA format consist several sentences, in which four important sentences are given below. More detail about the NMEA sentence and its data format can be found here. These strings contain many GPS parameters like: Time, Date, Longitude, Latitude, speed, no. of satellites in used, altitude and many other things. For any location coordinates and time, we can use $GPGGA and $GPRMC. For Date and time we can use $GPRMC string. Mostly this string is used for taking time, date and speed. yes you can upload a blank program or led blinking program. Thank you for uploading this vedio. I have done this, now i want to extract only gprmc code and with 5 minutes interval. Please help me to finish my project. Its already mentioned that we only need the serial circuitry of the Arduino. This is called the Gateway mode. what will happen if u dont remove the IC? Follow the complete procedure carefully. 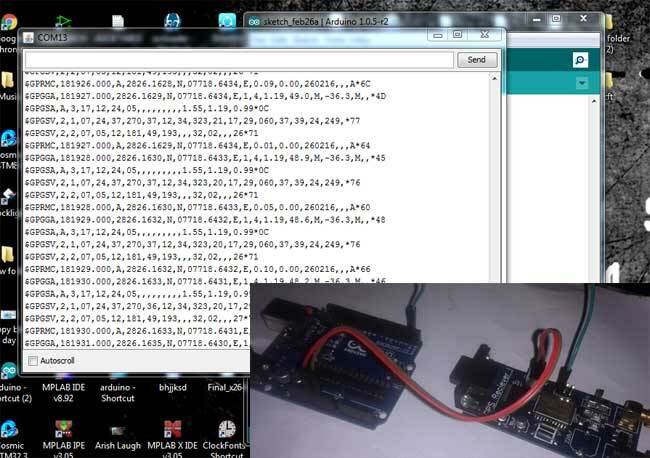 hello selvakumar, please check the baud rate in the code and set the same baud rate in arduino serial monitor. 1. Why didn't you install a GPS Shield instead of a GPS Receiver? 2. What are the difference between these two components? 3. Do we really need an internal + an external GPS antennas if we use a GPS shield? 4. Did you insert a SIM CARD to your GPS Receiver? 1. You can use GPS shield with Arduino, it will be better. 2. GPS shield is specifically for Arduino and can be fit on it easily whereas GPS receiver can be used with any microcontroller. 3. Antenna will depend upon your GPS module, some module have it and some dont. 4. No, SIM isn't inserted in GPS module. in the serial monitor the gps gives the nmea format but doesnt show any latitudes or longitudes , but i get result like, when the gps is not in range.what can i do now to get my gps receiver to a range. @ganapathi and @Ajay: If you are getting NMEA string without Long and Lat, that means your GPS module is not in range. Try placing the antenna in open sky and also provide proper power supply to it, it has two options for power supply 3v or 12v, set it correctly. How to get GPS longitudes and latitudes as variable from arduino kit, further i can use this variable in other purpopse. your help would be greatly appreciate! how to choose gps module for our preferred arduino? Yes, but you should check datasheet of GPS before connections. my project is " Smart helmate and accident detection''. In that first i detect accident happened or not, if yes then send location to nearest hospital and any one of his/her friend or family. The problem is I don't know how to do. i'm getting continuous data in serial monitor, i need specific coordinates of location and to send that msg to hospital and friend im using gsm kit with arduino. Please if u help me in this it will be great to me. Actually i have to receive the date from gps receiver by providing power supply to gps of 3.3v. How can i get that data as wireless? I hope i will get an answer. In the serial monitor, I'm getting a single line output which consists of one NMEA string. How do i get multiple NMEA strings as shown in the video? Can you please provide me the code for skytra gps along with the connection? I am unable to get the output. My gps receiver sim28m is always out of range. How to bring it into range? How can I display only the longitude and latitude data? I only need the two and Im using sim808 gprs/gsm+gps shield v1.1. Can u give the Code for this project? sir i used the gps28ml module and i connected it as per your connections but i didn't get any values on my serial monitor.is there any process to test my gps28ml module? how much voltage i should give to my gps28ml ? i directly connected 5v from my Arduino.is there any problem? Abhishek please connect with me. I have a project for you. i couldn't find the code for gps module to receive latitude and longitude. can anyone send it to me?